Rado lets us peer into the complicated work that is behind one of their timepiece with this incredible limited edition skeleton watch. While the bracelet and case are crafted from black ceramic, the dial lets you peer inside the inner workings of the watch for a glimpse of the sheer craftsmanship it takes to make one of these pieces. The hands help tell the time and the bezel is lined with a coloured radial pattern that matches the inner workings of the watch. Swiss-made with a clear showcase of the precision and patience required to craft this uniquely special timepiece. 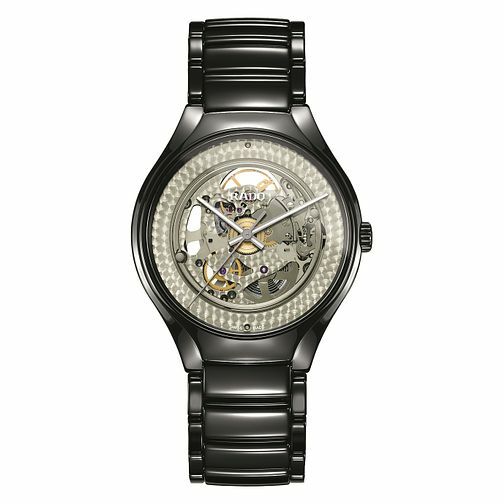 Using high-tech materials such as ceramic, Rado produces design-led, innovative watches that are unique in the market.